Over a quarter of the transpacific container trade is at risk from the deepening China-US trade war, as the US threatens to impose another $200bn of tariffs on a new range of Chinese exports, according to new analysis from shipping association BIMCO. Last month, the US administration announced plans to add a 10% tariff to a list of goods worth $200bn a year, and included “more consumer goods than previously seen, varying from bicycles to fish and Christmas lights” – although it will be reviewed before implementation, the US administration later indicated that the tariffs would rise from 10% to 25%. The announcement came on the same day that the US the introduced a second tranche of its tariffs on $50bn worth of goods originally announced in May, which included new duties on plastics and oil products. According to BIMCO, the earlier $50bn tariff round affected 6.6m tonnes of seaborne trade, equating to 660,000 teu, on the basis of the global average container weight of 10 tonnes per teu and amounting to 5.9% of 2017’s eastbound transpacific container trade. The $200bn round of tariffs will hit a further 22.4m tonnes of goods, “which amounts to a further 20.1% of USWC imports in 2017, or 2.24m teu”. BIMCO calculates that this figure is represents 1.5% of global container traffic, which may not seem a lot – but it could have a significant impact on the shipping industry, Mr Sand said. “While the narrowly measured amount of impacted cargo may seem small in perspective of the entire market – the impact is the opposite. The shipping industry is trapped between a rock and a hard place in an already troubled market place. “In the tramp shipping market, uncertainty about where the next cargo will come from makes it very difficult to reposition your ship after discharge. For the liner shipping market, matching deployed capacity on trade lanes with actual demand becomes even harder. “Poorer service offers to customers and lower profitability seems inevitable,” he concluded. If there is one silver lining for carriers, it is that the range of counter measures that China can respond to the US with is rapidly diminishing, given the current trade imbalance between the two countries – China’s total imports from the US last year amounted to $129bn, and is dwarfed by US’s $506bn that it imported from China. 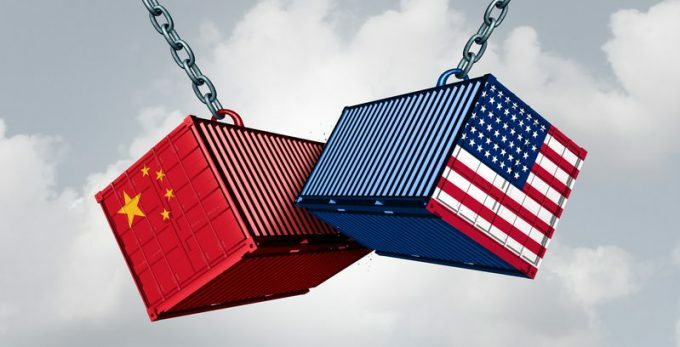 And in response to the traffic announced by US, China has already announced measures on $113bn of US imports – “China is fast running out of goods to tariff,” BIMCO said. Indeed, some of China’s measures have already proved to be counterproductive – the largest commodity by weight that it targeted was soy beans, which saw a 25% traffic introduced in July. However, news of the tariff caused the price of US soy beans to fall steeply with the end results that US soy is now 21% cheaper than from Brazil, which is the second largest soy exporter to China.